Penny board 22 or 27 inches? The main differences between the two sizes Penny Board 22″ and 27″ Penny Nickel Board are on the one hand in portability – the smaller one is better to carry – while the larger on is more stable while driving and is thereby easier to ride and to be controlled. It is important to say that both boards are handy and both boards are very good cruiser skateboards! You can tell a difference between the boards, but the advantage of one is not a disadvantage of the other one! The Penny Board 22″ is the classic Penny Board. It is 22“ long and very lightweight. It fits into many backpacks and suitcases and is ideal to take along because it is small and handy and doesn’t weight much. So you can take it with you on holiday, instead of having to rent a bike, for example. Also, when you go shopping, you can simply take the board with you in the store and you don’t need to search for a place for your bike and don’t need to lock it. The 27″ Penny Nickel Board is called Nickel Board. It is 27“ long and so it’s 5“ longer than his smaller brother. Thus, it is not that much larger, and just a bit heavier. It‘s still so small that you can take it well and it is still way easier to carry around as a longboard, for example. The big advantage of the 27″ Nickel is that it is much more stable when driving and generally runs a little easier. Especially in the city i like it better. Even beginners can easily ride the larger Penny Nickel Board because it‘s very easy to drive. To those who can not decide between a Penny Board and a longboard, I recommend the larger 27″ Penny Nickel Board. It drives very well, like the longboard, but it‘s way more handier and so you can take it well when you just can not drive. The longboard is just too big and heavy to carry around for a long time, while the Penny Boards are perfect sized cruiser skateboards. Personally, I recommend the larger 27 inch Penny Nickel Board, as it goes a little better and still has a good size. 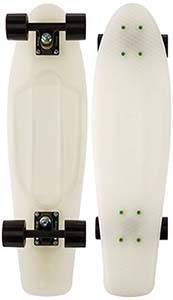 Although I ride the smaller Penny Board 22″ and I’m very satisfied and it can also be driven for a longer distance without any restriction, but if I had to choose one Board now, I would definitely go for a 27″ Nickel Board. For the great price you’ll get great quality and a lot of fun! I think the bigger Penny Board is just a little better to drive while still being small and handy. Both are perfect cruiser skateboards! You want your penny board as soon as possible? Then start your 30-days free Amazon Prime trial now and receive a fast free shipping on your orders! At Amazon.com you have a large selection of penny boards and often cheaper prices as on than the manufacturers' websites, also. You'll get your penny board with your 30-days free Amazon Prime trial the day after tomorrow your order and the shipping is for free. Buy now your Penny Board low on Amazon.com. penny-board-cheap.com is a participant in the Amazon Services LLC Associates Program, an affiliate advertising program designed to provide a means for sites to earn advertising fees by advertising and linking to Amazon. Certain content that appears on penny-board-cheap.com comes from Amazon Services LLC. This content is provided 'as is' and is subject to change or removal at any time.